There are many types of chicken feeders. But, there are two common types. The trough style and hanging cylinder or bucket type feeder. One that helps prevent feed from spilling out. Does not allow contamination from chicken droppings. Prevents feed from getting wet. I would start out by using a trough feeder for young chicks and buy a bucket type feeder when they get bigger. A good rule of thumb is to provide one inch of space per chick and three inches of space per chicken. If you do decide to use a trough feeder make sure it has a rolled lip on the edge to prevent spilling and a bar on top of the trough that rolls, preventing chickens from roosting on the feeder and contaminating the feed. 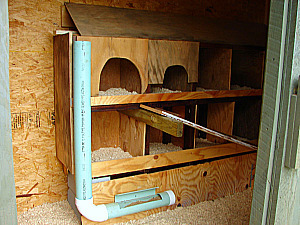 Another type is a wall mounted trough feeder, it is difficult for chickens to roost on these. Fill your trough feeder only 2/3rd's full, this will also help prevent the wasting of feed. Chickens waste only 10 percent of their feed 2/3rd's full vs 30 percent in a full trough. When you refill your trough feeder, push all the old feed to the end of the trough and fill with the new feed. Never put new feed on top of the old and empty your trough of all the old feed at least once a week. I personally use a cylinder type feeder. It is a homemade chicken feeder that I made. It is very easy to make and I saved money because I already had all the supplies on hand. I fill my feeder once every week but check on it daily. I mounted a chain to the ceiling of my chicken coop and attached the feeder to the other end. The chain allows me to adjust the height of the feeder as the chickens grow. As a rule of thumb it should be about level with the chickens backs. Be careful using mash in your tube type feeders, it sometimes has a tendency to compact and not flow properly. If You do use mash fill your feeder only 2/3rd's full. If you have space outside in your chicken run that is covered, this would be a good place to put a feeder. It encourages your birds to spend more time outside. Make sure you provide enough feeders for 1/3rd of your birds to eat at the same time, if you are feeding by raising chickens make sure you provide enough feeders for 1/3rd of your birds to eat at the same time, if you are feeding by free choice. If you are restrictive feeding, provide enough feeders for all birds to eat at once.